May 9 marked the beginning of an Israel Bonds mission to Israel. The 13-member Atlanta delegation, consisting of board members, spouses, family and friends, joined others from throughout the United States, Canada, Mexico, Brazil, the United Kingdom and France. 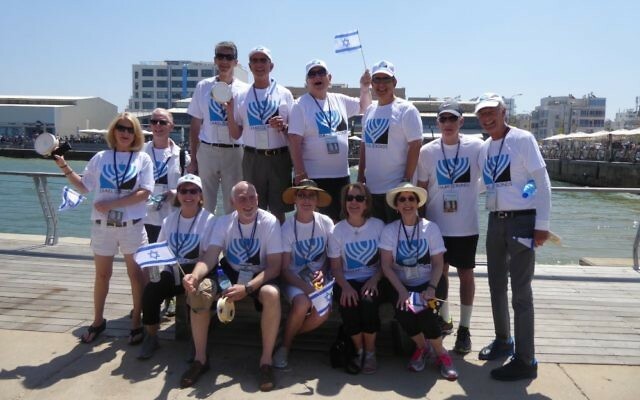 Over seven days, the 125-person mission visited the Haifa naval base, the Technion, Latrun, the Israel Museum, the Emek Haela Winery and the Tzora forest for tree planting. The visit coincided with Yom HaZikaron (Memorial Day) and Yom HaAtzmaut (Independence Day). Both occasions were emotional, from somberness to celebration. Joining the Israel Bonds mission from Atlanta are (standing from left) Jenna Rosenthal, Atlanta board Chairman Arthur Katz, Southeast Director Brad Young, past Atlanta Chairman Lowell Fine, past Atlanta Chairman Cary Rosenthal, past Atlanta Chairman Chuck Berk, national board member Adrian Grant and national Chairman Richard Hirsh and (sitting from left) Atlanta board member Bonnie Berk, Atlanta board member Ed Goldberg, Susan Sherman, Arlene Katz and Laraine Fine. Not pictured is Raanan Pritzker. It was a new experience for most of the group when the sirens blasted at exactly 1 p.m. on Yom HaZikaron, bringing the entire country to a standstill. Traffic halted, businesses ceased operations, and all Israelis paused in remembrance of the more than 24,000 Israelis who lost their lives in combat or by acts of terrorism. 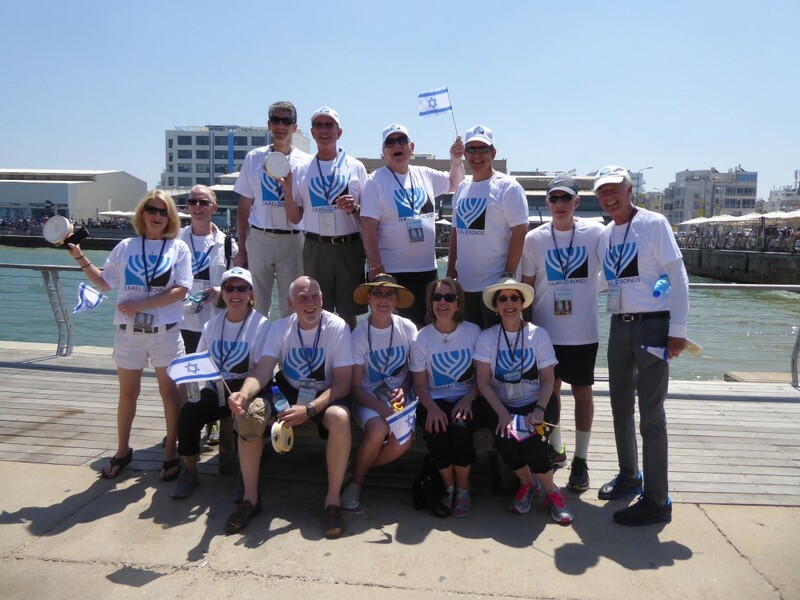 In contrast, the following morning our group marched along the beach in Tel Aviv, adorned in our Israel Bonds T-shirts, waving flags and playing hand instruments. Beachgoers all along the route stood and applauded. Returning to the promenade at our hotel, we, along with millions of Israelis, were treated to a spectacular demonstration by the Israeli air force. As most bond missions include a military component, all hands were on deck at the Haifa naval base for a tour of a cruiser led by a naval officer. Before we left the base, two of the new Dolphin class submarines were pointed out to us as they prepared to embark on their missions. Along the same lines, we spent a few hours attending a memorial service and talking with Israel Defense Forces men and women at the Latrun Armored Corps Memorial. They instructed us on the weaponry, tank components and other armored vehicles on display. There is an amusing saying in Israel that the national bird is the crane. Never has that been so true. Wherever one looks, especially in Tel Aviv, the sky is crowded with construction cranes. In an attempt to address the enormous housing shortage, high-rise buildings, some of which are comparable to the tallest structures in Atlanta, are rising everywhere. New three-bedroom condos in Tel Aviv begin at a selling price of $1.5 million. Shabbat dinner at the Waldorf-Astoria in Jerusalem was an evening to remember. Making it even more special was a contingent of lone soldiers invited to dine with us. Each table hosted a young man or woman from the United States serving in the IDF. All agreed that the food was considerably better than the routine army chow. Over the course of the visit we were joined by the mayors of Haifa and Jerusalem, a leading member of the Knesset, the director general of the Prime Minister’s Office and the accountant general of Israel. But the highlights had to be the visits with the president at his residence and the prime minister at his office complex. President Reuven Rivlin stressed the importance of maintaining Israel as the Jewish state and as a democracy for all citizens — Jews, Arabs, Christians and Armenians alike. Not only did he appear from the podium to be a warm and friendly individual, but also immediately after his remarks he joined the crowd to greet everyone and pose for pictures. Prime Minister Benjamin Netanyahu met with us in a room designated for this purpose. He began by thanking everyone for their support for Israel and for the significant role Israel Bonds plays in helping to finance infrastructure. After brief remarks about the leading concerns facing Israel, the prime minister took questions. He was patient and fully answered all questions in the time allotted. He did not mingle, but some of us were able to shake his hand as he departed. The meeting with the prime minister concluded the mission, and a feeling of accomplishment and joy was pervasive among the delegation. We also felt a heightened connection to Israel while having the importance of Israel Bonds’ contribution to our Jewish homeland reinforced. Cary Rosenthal is a past chairman of the Atlanta board of Israel Bonds.